Oklahoma City has gone from red to blue. For the past 17 seasons, Oklahoma City's Triple-A baseball team was known as the RedHawks. On Wednesday morning, the team announced that it will henceforth be known as the Dodgers. The announcement occurred as part of an open-to-the-public "Dodger Days" event and news conference at Chickasaw Bricktown Ballpark that included appearances by Los Angeles Dodgers director of player development Gabe Kapler and Dodgers outfield prospect Scott Schebler. New Oklahoma City Dodgers logos and uniforms were unveiled, with merchandise available at the team store. Oklahoma City's transition to the Dodgers moniker marks the second time this offseason that a uniquely named Minor League franchise has adopted the identity of its parent club (in September, the South Bend Silver Hawks became the South Bend Cubs). Oklahoma City had plenty of motivation to make the move, as in September the team was sold to an ownership group headed by Los Angeles Dodgers minority owner Peter Guber. An affiliation between Los Angeles and Oklahoma City, which previously had been affiliated with the Houston Astros, was part of the purchase agreement. "The Los Angeles Dodgers look forward to making Oklahoma City our long-term home for our Triple-A franchise," Dodgers president & CEO Stan Kasten said at the time the sale was announced. "We are committed to the great sports fans and the great city of Oklahoma City." 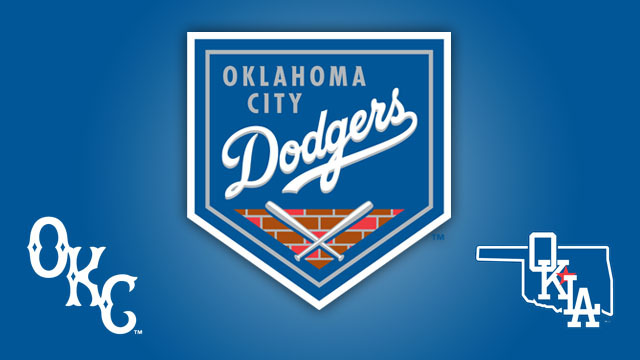 This commitment has been made tangible via Oklahoma City's new Dodgers identity. "From an early stage, we had a dialogue [with the new owners] about whether we'd rebrand as the Dodgers or as something different," said Oklahoma City Dodgers president and general manager Michael Byrnes. "We did a deep dive into all of our options and, after extensive brainstorming, we came to the conclusion that the Dodgers are one of the best brands in baseball. To connect with that brand made the most sense to all of us. "The Dodgers are an internationally known brand, so they don't do this kind of thing lightly. But they also thought that this was the best way possible to plant their flag here, so that we could really connect the dots with this new affiliation. This gave us a chance to use the Dodgers font as inspiration, while still finding ways to make it unique to Oklahoma City." Hence, the Oklahoma City Dodgers' primary logo, which features crossed bats overlaid atop a brick wall. This references the team's home of Chickasaw Bricktown Ballpark, located in the downtown entertainment district of the same name. The home cap features a diagonal white "OKC" atop a Dodger blue base, while the road cap features an interlocking white "OK" and "LA" above a Dodger blue rendering of the state of Oklahoma. These marks were created in-house by the Los Angeles Dodgers, an effort headed by director of graphic design Ross Yoshida. Byrnes, for his part, thinks the connections between Oklahoma City and Los Angeles go beyond the new affiliation between the clubs. "We've found in the last 60 days or so that there are a surprising number of Dodgers fans in this area, whether it's because they used to live in this area or simply because they decided to be a follower of the Dodgers," he said. "Route 66 originates in California and comes through Oklahoma, and there are industries here now that have left or are also in California; like Boeing -- they're a large employer here now. Things like that have been making themselves more apparent." With the Dodgers' era underway, front-office staff from both cities will be looking for ways to make the connection even stronger. "There are things that we've been doing well, but now the Dodgers can give us new ideas. We have a lot of things in the works," Byrnes said. "But some things will remain similar. There will still be a big focus on providing good customer service, a clean ballpark and a great entertainment value."